Mmmm. 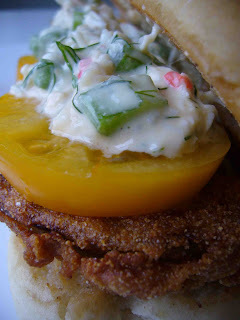 The fried green tomatoes were so good the other day that I couldn't resist making more. I often fantasize about the lobster rolls so common on the east coast. Those sandwiches were my inspiration when I decided to pick up some fresh crab meat and make a crab salad to top the fried green tomatoes. When I went out in my backyard to pick my green tomato, I was delighted to find one small yellow globe of delicious ripeness hanging on the vine. I grabbed it to slice and add to the sandwich as well. Combine crab, celery, mayonnaise, mustard, lemon juice and dill. Split open and toast the french rolls. If you've just finished making the fried green tomatoes, drain off most of the oil and toast the rolls directly in the same pan. Lay two slices of fried green tomatoes on the bottom of each roll, followed by the fresh tomato slices and finally the crab salad. Enjoy! *Note: if you're using crab claws like I did, you'll want to first get a little more than a 1/2 pound to account for the shells. Secondly, a good technique for getting every little bit of meat is to pull the two pieces of claw apart as shown until they come fully apart. 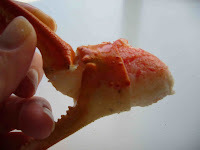 The connective tissue will pull out the back attached to one piece of claw while leaving all of the meat in the remaining claw shell.